In July 2016, the CSR Dialogue Forum was raised to the consultative status of the United Nations. The NGO’s expert knowledge in the fields of sustainability and CSR and due diligence were decisive for nomination. This recognition granted by the United Nations emphasizes the international relationships of the CSR Dialogue Forum. Environmental Award 2016: In September 2016, the CSR Dialogue Forum was presented with the Upper Austrian Provincial Award for Environment and Sustainability 2016. The CSR Dialogue Forum could win through in the award category “Associations and Groups”. 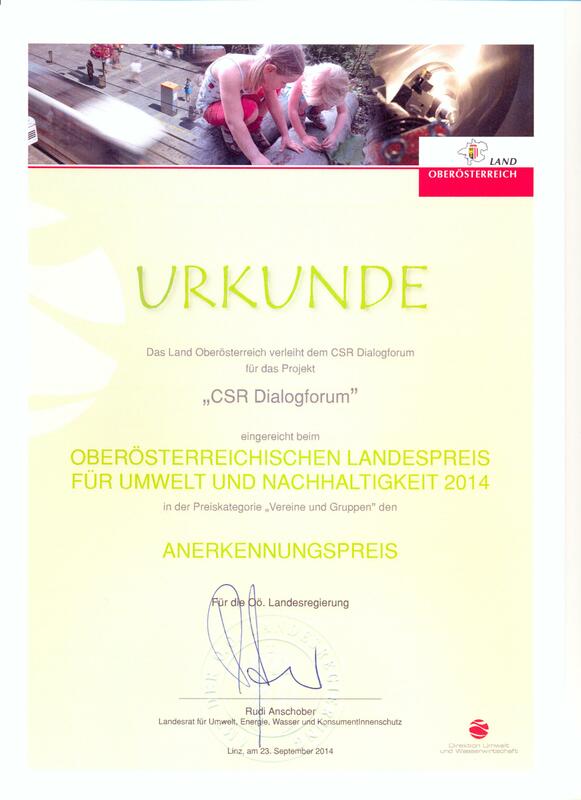 This Award means that the CSR Dialogue Forum was distinguished for its performance and accomplishments in the field of sustainability in Upper Austria.